→How Do Red Dot Sights Work – Unlimited Guide! Now if you glance at the optics section of any online gun retailer, you might be likely to feel overwhelmed because of the number of choices on the market. However, we can not deny the popularity of the red dot sights. They are among the most common optic solutions for modern sporting rifles. This type of sights permits shooters to keep both eyes open and place a dot-shaped point of aim over the target. And what are other exciting things about red dot sights? Let’s find out with me. So, What are Red Dot Sights? How Red Dot Sights Work? For Which Purposes We use Red Dot Sights? They are non-magnified sights for firearms and other aiming devices. These sights help the users pinpoint the target with an illuminated red dot. 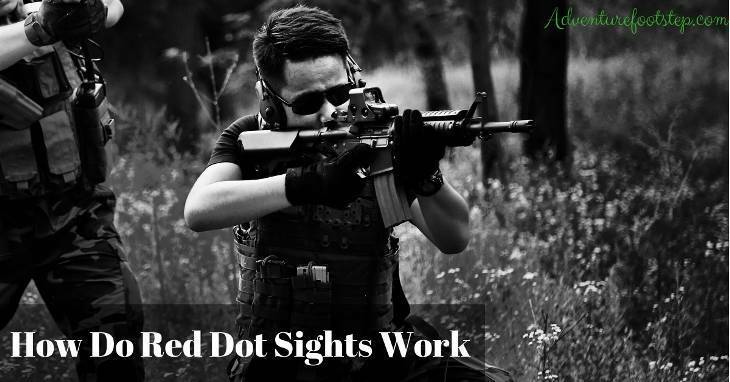 A red dot sight uses an LED (light-emitting diode) at the focus of collimating optics and a reflective objective lens that send the dot’s image back to the shooter’s eye. Most red dot sights fall into one of two categories, either tube sights or open sights. These sights provide you with infinite eye relief, and the single lens enables you to acquire the red dot at a wide field of view. The LED emitter is open, which may obstruct the sights with dirt and debris. The LED is placed at the rear of the housing, reflects the objective lens of the assembly to your eye. There are two lenses and integral parts inside the tube. The larger the tubes are, the more room you will have to find the dot when you snap your rifle up to aim. With this type of sights, you can make fast transitions from target to target. Most of the red dot sights have either active or passive adjustments for the dot brightness. As a result, you can have a clear dot for high visibility in bright conditions, and a very dim dot to prevent loss of night vision in low light conditions. If you are intending buy a red dot sight for your ar 15, you should read my post here. LEDs found in red dots don’t use much power. The LED is a rigid material and consumes very little power, allowing battery powered sights to run for hundreds and even tens of thousands of hours. If keeping your rifle in a state of readiness is your concern, rest assured that higher end dots can be left on for 50000 hours. It is much simpler to use a sight with a dot-shaped reticle because the small diameter image does not require a sophisticated optical reflector to focus it. The size of the hole on the LED determines how big the red dot is, which you can measure in MOA (minutes of angle) or mils (milliradian). Red dot sights are fast object-acquisition optics. With them, you can take quick shots with accuracy when it’s zeroed. You can also use red dot sights without paying attention to focus, parallax and eye relief issues. As said before, red dot sights utilize a laser or light beam to project an image onto a piece of glass. Although the glass is transparent, it reflects certain colors, which leads the projected laser or light beam to be reflected towards your eye. Firstly, you can see from the diagram that the light comes from a position below your eye and points in a direction that would be above at which you're targeting. If you remove the glass and use a laser pointer instead, the laser will point up in the sky and not towards your target. That means you will not be able to see the light. The second thing that you can't see in the diagram is that the tinted glass prevents the light from shining through if you are to be looking directly at the red dot sight. For example, the red dot sight has tinted red glass on the other side, so attempting to spot a red dot there would be difficult. What’s more, it doesn't shine through because it's designed not to. We can consider red dot sights as quick acquisition sights, and they are also easy to use. Why? Because red dot sights place the target and the reticle on almost the same optical plane, creating a single point of focus and allowing the user to keep their attention on the field of view in front of them. It’s effortless to use them for target shooting, hunting and in the military. Red dot sights are also popular among paintball and airsoft players for the same reasons. People also use red dot sights on cameras and telescopes to photograph flying aircraft, birds, and other distant, fast-moving subjects. Red dot sights are simple optics and easy to use. People design them to view targets at close to moderate ranges with no magnification. The dot is easy to pick up and allows for quick shots. The downside is that they are not suitable for longer distances or precision shooting. Because red dots generally run on less complicated technology, it’s cheaper than other sights like holographic products. Do you find the article informative? If it’s useful for you, please like and share it. Leave a comment below to let me know about your thoughts and opinions. And I wrote a post about best scope for ar rifle, don't forget to read it if you like to use an scope than red dot.